Even after his crucial role in Mayor Ed Murray’s “grand bargain” for affordable housing, Jack McCullough, a lawyer for developers, is little known. He likes that. Mayor Ed Murray wanted a strategy to keep Seattle housing from becoming too expensive. He knew it had to go through Jack McCullough. A lawyer for big developers, McCullough held the launch codes to the nuclear option feared by City Hall — costly and unpredictable litigation likely to stall any progress. As long as a lawsuit McCullough filed against the city was still on the table, a deal to get millions for affordable housing from developers was in jeopardy. “If I was going to get them to walk away from a lawsuit, he was my path to doing that,” Murray said. McCullough is one of the top land-use lawyers in the region — many say the best — with clients from the Gates Foundation to Chris Hansen, the hedge-fund millionaire trying to build a sports arena in the city. 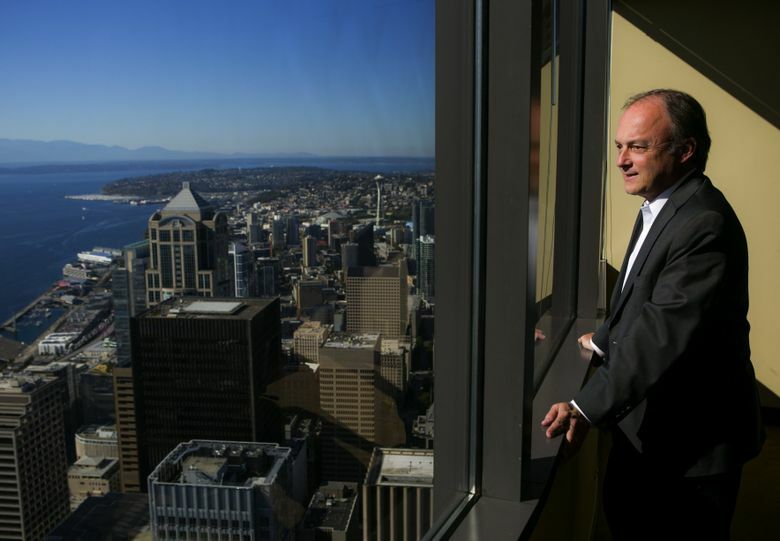 He’s helped shape Seattle’s skyline and policies that govern who gets to build what and where. Marty Kooistra, a leader on the affordable-housing advocates’ side, knew McCullough’s reputation. “I had heard Jack was a power broker, that he represented the Downtown Seattle Association and others, that he was really the one making decisions,” said Kooistra, executive director of the nonprofit Housing Development Consortium. But during negotiations in the summer, McCullough turned out to be more Yoda than Darth Vader. He was smart (two degrees from Harvard) but listened, powerful but didn’t bully, willing to fight but more interested in peace. “Jack was jovial, not cold and calculating,” Kooistra said. Those are traits you can afford when you represent wealthy clients who have the ear of decision-makers, said Dave Bricklin, a lawyer who has argued against McCullough. Soon McCullough and five others reached a compromise Murray called the “Grand Bargain.” The city would pull back some of its proposed mandatory fees on development while still moving toward its goal; McCullough would holster his lawsuit challenging the city’s system of collecting fees from developers for affordable housing and another one in the works. The deal might even create a lasting truce between developers and advocates. It may also mark the high point, McCullough said, in his three-decade career, which is no small feat. Despite his influence, McCullough, 58, has never been profiled in the media because self-promotion is generally not in the interest of his clients. There’s no marketing or social media campaign for the 13-lawyer McCullough Hill Leary firm. Instead, he jokes, he shows people the firm’s conference rooms on the 66th floor of the Columbia Center. The views of downtown and Elliott Bay say “success” in a nice Seattle way without him even mentioning all the crane-sprouting projects he represents below. “I don’t use anybody else,” said Martin Selig, who built Seattle’s tallest skyscraper, the black-sheathed 76-story Columbia Center, in the early 1980s. McCullough’s gift, Selig said, is balancing private and public interests in a project so both sides get some of what they want. Dan Ivanoff, founder of Schnitzer West, agreed. Ivanoff has worked exclusively with McCullough since 1991 when the two teamed to develop 2 million square feet of industrial property in the Kent Valley. More recently, Ivanoff sought McCullough’s counsel for his high-rise project in downtown Bellevue, The Bravern. What distinguishes McCullough from other elite land-use lawyers is his ability to see “land mines” and navigate the “political overlay,” Ivanoff said. He also brings a disarming smile, deep knowledge and “help me help you” style to negotiations about fees, size, views, traffic, design and process, process, process. McCullough’s success is about more than his clients’ clout, said Peter Goldman, who battled him in court on Hansen’s arena proposal. “He’s obviously a very good lawyer,” Goldman said. Exhibit A could be McCullough’s argument that Hansen’s arena was a private venture. That meant it could go in Sodo, where Hansen wanted, without considering alternative sites the way a public project must. Despite a $200 million public investment in the arena and agreements with Hansen signed by Seattle and King County elected leaders, a judge was persuaded by McCullough’s logic. “The whole deal, in my opinion, is Jack’s engineering,” Goldman said. After Harvard, McCullough knew he liked land-use law. He wanted to put deals together, not take them apart. The West Coast was a hotbed for land-use law in the 1980s, he said, and his home state of Montana couldn’t consistently offer the sophisticated work he wanted. He came to Seattle, starting at the Foster Pepper firm. He created a small firm in 1995 that evolved into McCullough Hill Leary. He’s done well. He and his wife, Sandy, a retired public affairs consultant, own homes in Magnolia and Idaho, as well as three rental houses. They bid $40,000 at a Save the Elephants auction emceed by Pierce Brosnan in 2006, according to the Puget Sound Business Journal, to visit Africa with their then-7-year-old son. But McCullough, whose parents were a laborer and secretary, knows not everyone is doing so well, and festering social problems aren’t in the interest of his clients. He said as much in a speech last year to the Downtown Seattle Association (DSA), at the end of his stint as chairman of the advocacy group. He saw the “ghost of Seattle future,” he said, and it was San Francisco. With Seattle’s politics veering left, it was time to restore a partnership, he said, between those who govern the city and those who build it. That collaboration had been based on a “this-for-that” voluntary system that allowed buildings more height in exchange for fees for affordable housing. It had frayed in recent years. McCullough sued the city after it slapped higher fees on downtown projects in 2013. The City Council approved a resolution last year supporting mandatory fees on new buildings. Collaboration was easier in the past, McCullough said, when a local developer, banker and contractor were behind a project, he said. The city’s globalization has eroded some of that trust, he said. During evening negotiations this summer in City Hall, McCullough and Kooistra rekindled some trust. “I would say, ‘This is the fear of my people’ and he would say, ‘I understand.’ It was a little different than I expected from someone with the power-broker capacity,” Kooistra said. When the deal was memorialized on a July morning in the mayor’s office, McCullough’s voice cracked during his remarks, said Kooistra. Councilmember Mike O’Brien, chair of the council’s land-use committee, agreed to pull back his mandatory “linkage fees.” By shelving McCullough’s lawsuit, the Grand Bargain could provide a clearer, more certain path to more new housing than his fees, O’Brien said. His target was 6,000 apartments affordable for people making less than 60 percent of Seattle’s median income — roughly $38,000 for a single person. “I’m on board with this as long as we end up at 6,000 units. If it drops below that I’m going to take the linkage fee and run with it,” O’Brien said. Although it is supported by large coalitions on either side, the deal remains fragile. It’s possible a developer may not feel bound by the agreement and could still sue, the mayor said. In agreeing to the deal, McCullough himself laid down strict conditions. If the City Council does not legislate key parts of the bargain this year — or makes “material” changes to it — his lawsuit would be back on. In negotiations, Murray believes McCullough wanted to be more than a lawyer getting the best deal for developers.